This session is run weekly by ABC members to give children who might be finding playtimes difficult for different reasons with a quiet place to have a chat and enjoy some games and activities together. 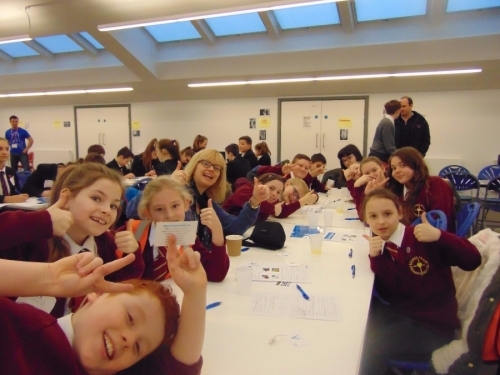 This hugely popular event helped to reinforce messages about how kindness is so important and bullying unacceptable. Everyone joined in and had a lot of fun! Photos from the day are displayed in school. This was run by the Y4 members of the ABC for all the children in Y1. The title of the workshop was ‘Making Friends and Staying Friends’. The aim of this was for the children to recognise some key friendship skills and how to stay friends by listening to each other for example. The children also thought about who they would turn to for help if a friend was in trouble. 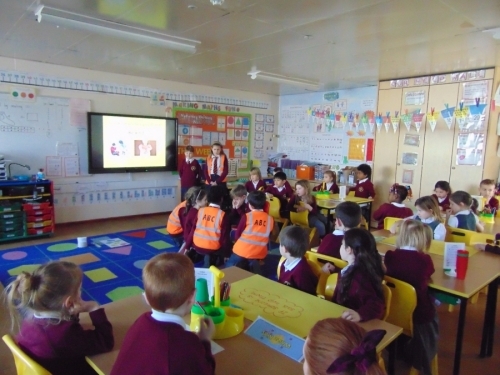 The Y1 children had a chance to watch some role play by the ABC to underline their message and worked in groups to brainstorm what the ideas would mean to them. This training was for all the new ABC members. In it we looked at the qualities that make a good anti-bullying ambassador, the role of the ABC at Sacred Heart School, our school definition of bullying and also some role play of different situations and thinking about what could be done to help children. The children also had the chance to play some fun games in which we underlined how everyone is special in our school. Some of our experienced anti-bullying ambassadors attended this new training in which they had the opportunity to work with students from other schools to gain more knowledge about bullying issues. They learnt about mediation and public speaking and had the chance to network best practice and share ideas about how this could be used at Sacred Heart School. It was a really exciting day! Everyone enjoyed our latest Smile Day at School. The aim behind this is to help everyone feel positive and happy at school. The ABC led the way in this as Smile Ambassadors and awarded stickers for the best smiles all day. The ABC aim to spread our anti-bullying message in as many ways as possible. Check out their video policy for children giving some top tips and information about what bullying is, what to do if you are a target of bullying and how school will help. Tich from the Anti Bullying Ambassadors programme, run by the charity The Diana Award, visited our school to find out about our Anti Bullying Ambassadors and their work in school. We are used as a case study school by them. As part of our regular schedule of events run by the ABC, children who have been nominated by the ABC for various acts of kindness around the school are invited for tea and cakes with Mrs Cullen, our Headteacher. The ABC lead assemblies across the whole school to raise awareness of bullying and what can be done by everyone to stop it. The ABC share training that they have had with the staff. Their latest staff meeting dealt with anti-bullying policies, mediation skills and also planning future actions for anti-bullying work. They have also run meetings on the difference between intervention and prevention when dealing with bullying, wellbeing ideas and actions. This workshop helped the children to recognise the unique qualities that everyone has. The ABC performed a short play about the effect of unkind or thoughtless words and actions and how these can stay with an individual for a lifetime. They also shared the 'Apple Experiment' - the message being that although the damage of unkind words cannot be seen, it is deep and far reaching. The Y3 ABC ambassadors led this workshop for Y2 as they make the move to Y3 in September. The aim of this was to address any worries, concerns or questions that they have about the move to KS2. This involved having a tour of key areas, lots of information sharing and the chance to ask plenty of questions! This was a day to promote and celebrate kindness to others. There were lots of activities going on throughout the whole school, both in the playground and in classrooms for all ages. Please see the gallery for pictures of the day.